The Stanwood Needlecraft Wooden Umbrella Yarn Swift is great in theory. 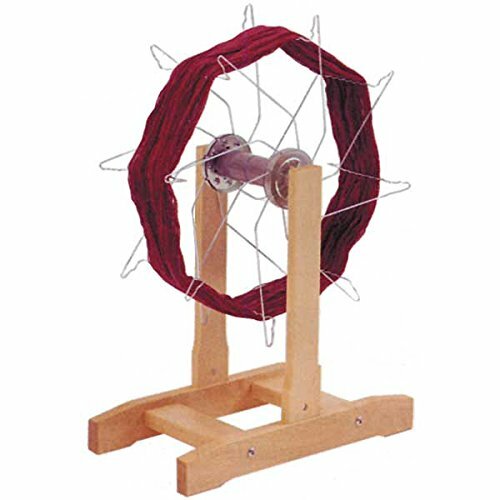 I love its price and functionality, and it does make winding yarn easy and fast. But I do have some concerns that I’ll cover in my review. Focusing on product quality, Stanwood Imports is fairly new to needlecraft. Since 2006, it has manufactured its own products, including yarn swifts. 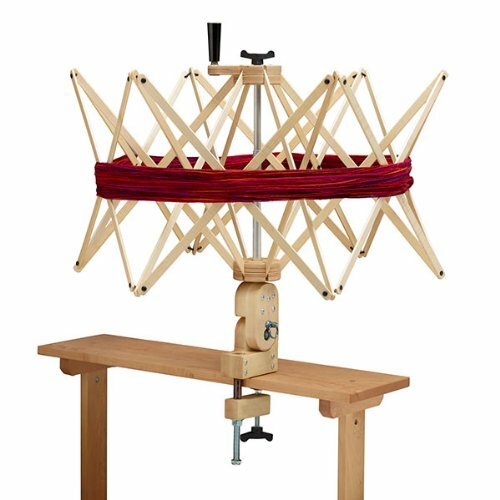 The medium-sized Stanwood Needlecraft Wooden Umbrella Yarn Swift holds small to medium sized hanks up to 60 inches in diameter. The large size holds large hanks up to 8.5 feet in circumference. Both are so compact when collapsed that some knitters leave their swift tucked out of the way, but still clamped into position. This umbrella swift does a great job winding yarn. The unvarnished wood has a similar feel and appearance to wooden knitting needles. The wood can be noisy when winding yarn. These are flaws, but not dealbreakers. If you want an all wood swift that assembles and collapses easily, give this one a spin. It is beautiful and sturdy. However, you probably need to spend more time on routine maintenance to make sure it holds up over time, and even then its longevity is doubtful. If you ever want to use the Stanwood Umbrella Swift for large hanks, make sure you get the large size. How Well Does the Stanwood Wooden Umbrella Yarn Swift Work? 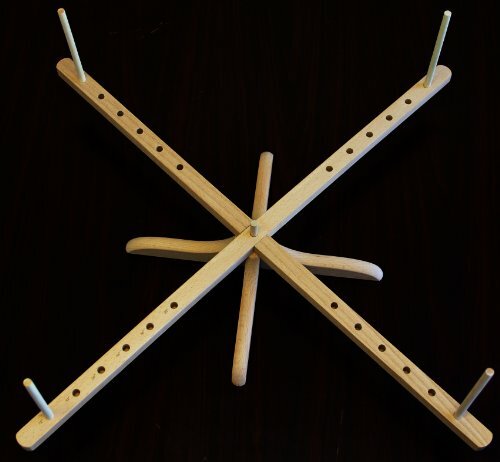 The Stanwood Umbrella Yarn Swift is made of wood, even the screws to hold the umbrella ribs in place and to clamp the swift to a surface. Metal rods hold the ribs to the wooden central rod. Cotton thread holds the ribs together. Due to its all-wood construction and because it has no external coating like varnish, this swift can become noisy when spinning. A bit of beeswax rubbed onto the central rod appears to take the noise away. You may have to reapply the beeswax as a part of routine maintenance. The cotton thread holding the ribbing together helps prevent yarn snagging when you put a hank on the or when the last few yards spin off. However, the thread can wear out over time. The Stanwood Umbrella Swift comes in two sizes: medium and large. The medium size holds yarn hanks up to 5 feet in circumference. The large holds hanks up to 8.5 feet in circumference. The medium size is cheaper, but if you think you will wind large hanks, it’s more economical to buy the large size. Otherwise, you might find yourself with a large hank and a need for a bigger swift. Storage space: Both sizes of this yarn swift collapse quickly and neatly into a tidy bundle, like an umbrella. Simply loosen the screw holding the ribs in place on the central rod. Pull the bottom knob downwards and watch as this swift goes from taking up space to taking no space. This swift works great on all yarn weights from the finest spun mohair to super chunky roving. With no metal hooks on the ribs to catch or snag yarn, even the finest gossamer strands wind off easily from start to finish. Remember to stop the swift from spinning if you must stop while winding especially when using a ball winder. Otherwise, the swift will keep rotating and yarn will continue to stream off. Also, make sure you buy the right size yarn swift for your needs, as the medium size of the Stanwood Wooden Umbrella Yarn Swift does not expand enough to be used with large yarn hanks. This yarn swift is sturdy and holds up well under repeated use. Once clamped on a surface, it stays in place without moving or pulling back and forth as it spins. Although the wood can take a lot of punishment, it can break if dropped, stepped on, or bent. The Stanwood Wooden Umbrella Yarn Swift does require regular maintenance. It is all natural and unfinished, without paint, varnish or oil. If you live in a dry climate, you may need to rub oil or beeswax into some of the swift’s parts to keep the wood from drying out and cracking. Vulnerable areas in dry climates include the screws, screw holes, and the central rod. For climates with high humidity or moisture, applying beeswax or oil on the screws and screw holes, and the central rod helps keep moisture out of the wood and helps retain the perfect fit. The cotton thread holding the ribs together can wear out with use. I really like how the Stanwood Wooden Umbrella Yarn Swift collapses to a small size. It’s great for taking anywhere, even knitting clubs, family barbecues and retreats – indoors or outside. This yarn swift is nice and sturdy. The all wood construction eliminates the swift moving or wobbling when in use, unlike swifts with a thin metal central rod. Many knitters use beeswax or other solid type wax or oil to eliminate the friction between the ribs and the central rod. All’s well that zen’s well. So to speak. 1. Knitters on a budget might find this swift does the job. 2. 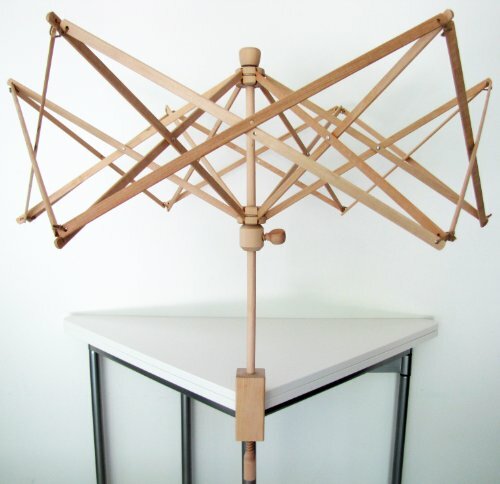 Like other umbrella style swifts, this model collapses for easy storing. 1. Knitters find this swift works best for hanks of lighter weight yarns with small to medium circumference. 2. The vertical turning of the wheel makes this swift a great tool for reskeining yarns. 1. Knitters appreciate how simple this swift is to use, but dislike that it moves across tables while in use. 2. Needs to be disassembled for storage. 1. Compares favorably to the Stanwood Wooden Umbrella Yarn Swift for all aspects, with great durability. 2. 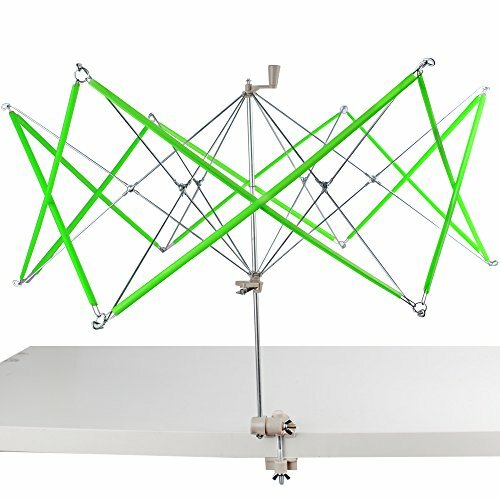 Additional features include vertical spinning, yardage counter, and hand crank for turning.